With its intricately colored plumage, the largest owl in Europe is truly an impressive bird. 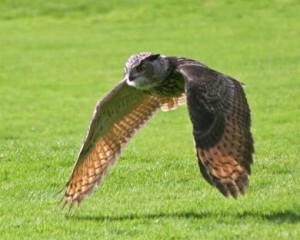 The European Eagle Owl is, however, a bit falsely named, since these raptors are found in many areas outside of Europe. European Eagle Owls make their nests in a variety of habitats, from forests to drier desert areas. They usually use a rock ledge or cave as a base for their nests, though these owls have also been known to use abandoned nests of other large birds. 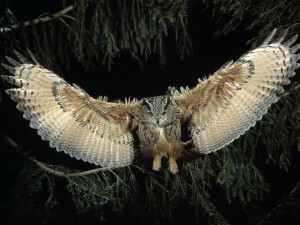 At night, the European Eagle Owl is active, flying swiftly and noiselessly while scanning the ground and the air for prey items. These birds will eat insects, smaller birds, small reptiles, fish, and small mammals up to the size of a fawn. 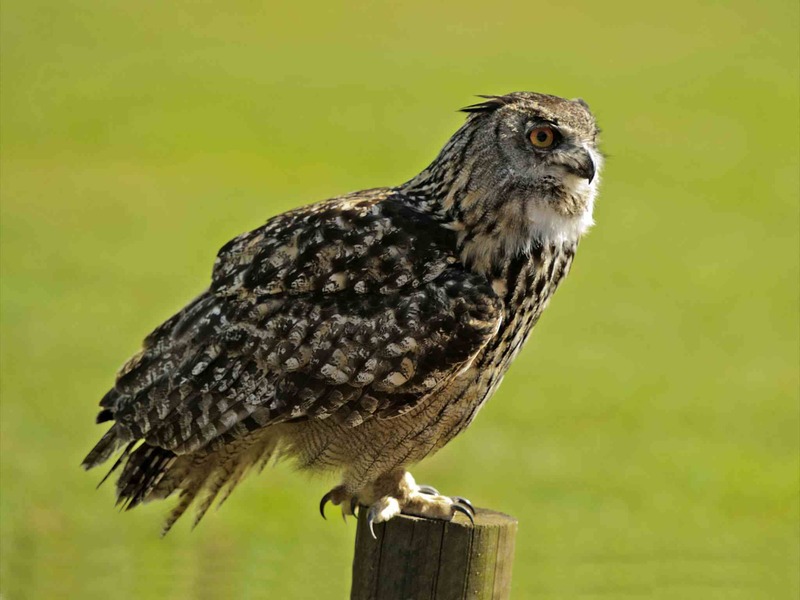 Most often, however, European Eagle Owls prey on animals smaller than rabbits. The European Eagle Owl has pointed ear tufts that it uses for display purposes. It can move the tufts to indicate its intentions. The ear tufts may also serve as camouflage, breaking up the body outline. European Eagle Owls also vocalize to indicate mood; they can growl or bark if they feel threatened. Normally, however, their call is the typical “oo-hoo” noise that many people imagine owls producing. Although European Eagle Owls are territorial, often owls will share overlapping home ranges. The European Eagle Owl is the largest owl in Europe. These raptors are about 27 inches (69 centimeters) long and males are smaller than females. Females can weigh about nine pounds (between 2,280 and 4,200 grams), though males usually weigh just over half this. Normally a female European Eagle Owl’s wing is about 19 inches (48 centimeters) long, and a male’s wing is about 18 inches (45 centimeters) long. Both sexes have mottled feathers. Brown, gray, and white are the predominant colors. The upper parts of the European Eagle Owl have a buff colored base over which darker markings are speckled. The neck sports several dark stripes all around the neck, and the shoulders and back of the owl tend to have larger dark splotches, while the dark markings on the head are smaller in size. The large ear tufts, that the owl can raise or lower, are very dark brown. 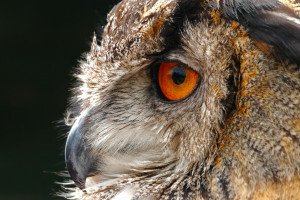 The inside of the ear tuft shows a buff colored band, often with darker speckling, that runs down above the inner eye to the base of the owl’s beak. The buff face is speckled with darker colors more heavily along the edges, so that it is framed with brown. 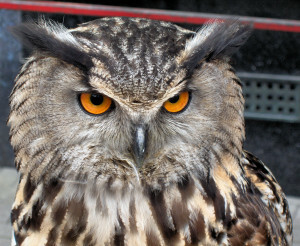 European Eagle Owls have white chins and necks, and often this coloration bleeds down into the breast. The remainder of the underside of the bird is buff, marked with wavy dark lines. The upper tail coverts and the lower back are similarly colored, though darker speckling is also evident. The tail itself is a bit darker in color, though the pattern is basically the same. Six very dark brown bars delineate the tail. 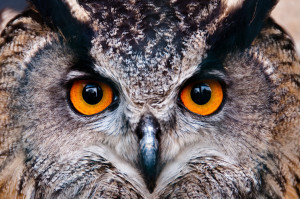 The eyes of European Eagle Owls are orange or yellow. Its beak and talons are large and black. The legs of the European Eagle Owl are feathered in buff plumage with faint wavy dark stripes. European Eagle Owls are found in Europe, particularly northern Europe, and they are also found in North Africa, the Middle East, and other parts Asia. Though once a very populous species, the European Eagle Owl’s numbers have suffered in recent years from habitat loss. These lovely birds are also shot and trapped. However, the species is not in grave danger of extinction at the moment. Because of their large size, European Eagle Owls should be allowed plenty of space in their captive enclosure. 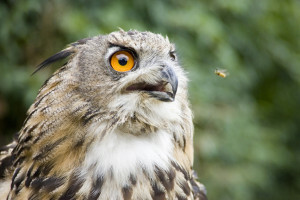 In captivity, European Eagle Owls should be fed a variety of appropriately sized prey items, often about the size of a rabbit. European Eagle Owls usually mate for life, beginning the search for a partner when they are two or three years old. The male will scratch at various nesting sites and solicitously call to the female. When she approves of a site, the pair will build their nest or use one that is already in place. Normally, European Eagle Owls lay their eggs in winter, producing one egg once every three days. The average clutch will contain between one and four eggs that are white in color. The female alone will incubate the eggs, which will require between 31 and 36 days to hatch. The male owl will feed her during this time. Hatchling European Eagle Owls will be brooded for about two weeks after they emerge. The father will remain near the nest for two to three weeks after they hatch. When they are about three weeks old, the chicks can eat solid food, and when they are 52 days old, they begin to make short flights. European Eagle Owls leave elevated nests when they are about five to seven weeks old, though three to four week old birds can sometimes leave nests lower to the ground. They will not leave for good until they are about 25 weeks old. In the interim, both parents care for the young European Eagle Owls. They will leave when the male begins to show courtship behavior again.